Somewhat uncommon due to reduction of habitat. Reported to naturally recolonize disturbed powerline corridors in boreal bogs (Coladonato, 1993), and was recommended for use in reclamation of following peat-mining projects (Famous and Spencer, 1989). Cooke, Sarah Spear. 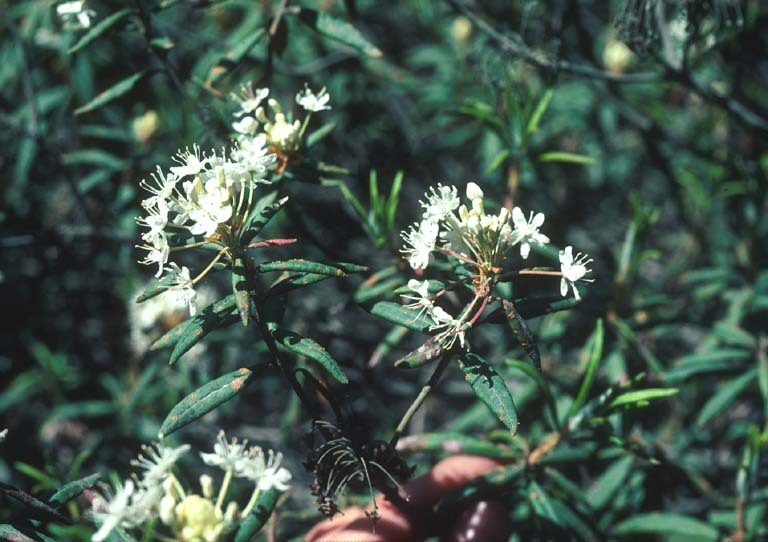 1997 A Field Guide to the Common Wetland Plants of Western Washington & Northwestern Oregon. Seattle Audubon Society, Seattle, WA 415 p.
Famous, Norman C.; Spencer, M. 1989. Revegetation patterns in mined peatlands in central and eastern North America studied. Restoration and Management Notes. 7(2): 95-96. Franklin, Jerry and C.T. Dyrness. 1988 Natural Vegetation of Oregon and Washington. Oregon State University Press, Corvalis, OR 452 p.
Schultz, Jan; Beyer, Patty; Williams, Julie. 2001. Propagation protocol for production of container Ledum groenlandicum Oeder plants; Hiawatha National Forest, Marquette, Michigan. In: Native Plant Network. URL: http://www.nativeplantnetwork.org (accessed 14 May 2003). Moscow (ID): University of Idaho, College of Natural Resources, Forest Research Nursery.